UPDATE - Parking is free with any paid registration for the convention. Please ask for your pass at the Registration Table. The block of rooms set aside at $129.00 are now gone and I suspect the few at $149.00 are gone as well. We have alternative hotels that are nearby. These three hotels are all within 5 minutes of the convention site, at the present time have rooms available for the June 15-17 weekend and have room rates from $100.00 to $135.00. They have no rooms set aside for our convention. Very near the old convention site. -Comfort Inn - 3031 No. 3 Road. 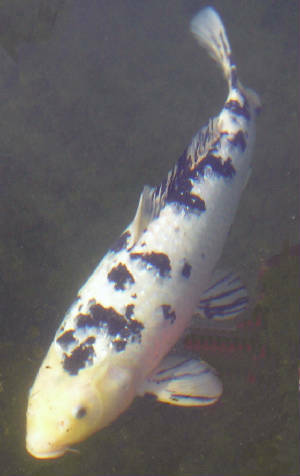 This beautiful 21" Gin Rin Bekko is another reason to attend the 2007 Convention - this wonderful koi has been donated by Peaceful Ponds and will be auctioned at the convention. We will provide a better photo by June, but right now you can see the koi happily swimming in a pond at Gil & Jan's. The club has hosted and held this Annual Convention for the PNKCA previously in 1999 and are now in the planning stages for the 2007 event. The Executive are hoping this Convention will be just as successfully as the previous one held in 1999. This a pet-friendly hotel (there is an extra charge). Our rates are $129.00 (Canadian) for double occupancy. This does not include taxes. 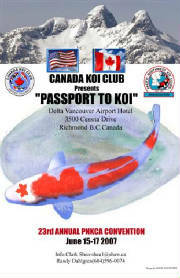 The Convention will be held June 15-17 at the Delta Vancouver Airport Hotel. This is located in Richmond, the city suburb located at the south end of Vancouver. For those who attended the last convention in 1999, also held in Richmond, this site is about 5 minutes past the previous site. You don't cross the Oak Street bridge but rather follow the signs to the airport and when you cross a little bridge over an arm of the Fraser River you can't miss the eight story building on your left. It is an attractive, pet friendly hotel that you will enjoy staying at. Parking is not a problem. More information will be included in the registration package. Bar - Lounge, Business Centre, Comp Coffee Tea, Concierge Guest Services, Gift Shop, Pool Outdoor, Air Conditioning, Clock Radio in Room, Coffee Maker in Room, Hair Dryers Avail, Cable TV in Room, Pay TV in Room, Licensed Dining Room, Restaurant on Site, Room Service, Shuttle Available.